The Kratos Axis Ultra XPS uses a beam of x-ray or UV photons to eject electrons from the near-surface region of a sample in a vacuum. The energies of those electrons are characteristic of the elements from which they came and the specific chemical bonds that involve those elements. By plotting the number of photoelectrons as a function of energy, one can obtain detailed information on the near-surface elemental and chemical composition of a sample. To reserve time or request training on this tool, click here or on the image at left to go to the K-alpha XPS tool page on SUMS. Deconvolution of Carbon spectrum in a graphene oxide film on SiC shows XPS ability to distinguish chemical states. View inside analysis chamber shows analyzer at top, sample at bottom and broad spectrum x-ray source at right. 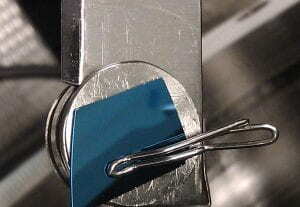 An integrated Ar sputter gun allows in-situ sample cleaning and depth profiles like the small dark blue area in the center of the above image. 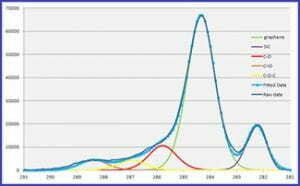 Several analysis techniques provide information about elemental composition (XRF, EDS, SIMS, etc.). For inorganic compounds that information is usually enough to determine a sample’s chemical makeup. However, for organic compounds, there are typically numerous chemical permutations even within the constraints of a given composition. 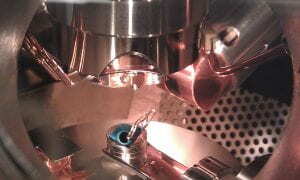 Standard XPS uses x-rays with energy around 1400 eV and detects the shift in core level electrons. The Kratos has a He-ion UV source, whose energy couples more strongly to valence-level electrons. 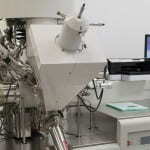 This additional light source enables the system to do Ultraviolet Photoelectron Spectroscopy (UPS) measurements that give more detailed information on the outer electron layers which are directly involved in chemical bonds. X-ray source: Monochromated Al Kα radiation; Focused to an area ~500μm x 800μm. Sputter gun: Ar+ ion gun; Ion energy selectable from 200 to 4000 eV.